The 38th Annual Beverly Hills Art Show – Affaire In The Gardens will present a special exhibit curated by Peter Mays, Executive Director of the Los Angeles Art Association, of Los Angeles-based emerging artist Marjan Vayghan’s ‘Legacy Crate Series.’ This ‘light box installation’ features four wooden crates and will be on view throughout the duration of the Art Show, taking place at Beverly Canon Gardens, May 21-22, 2011. Created over a two-year period, and inspired by Vayghan’s personal accounts of Iran’s Green Revolution, this multi-layered exhibit seamlessly blends mixed-media, sculpture/new generation installation and performance art. The Legacy Crates are each inspired by a different day in Vayghan’s life during the revolution. They have been described by art critics and curators as insightful, and unyielding. Part experiential art, three of the four crates open, and are each equipped with two unique sets of light and audio sensors which are set to alter the level of light and audio based on audience participation. Visitors are invited to see, hear, and touch each crate, as each offers a unique perspective. 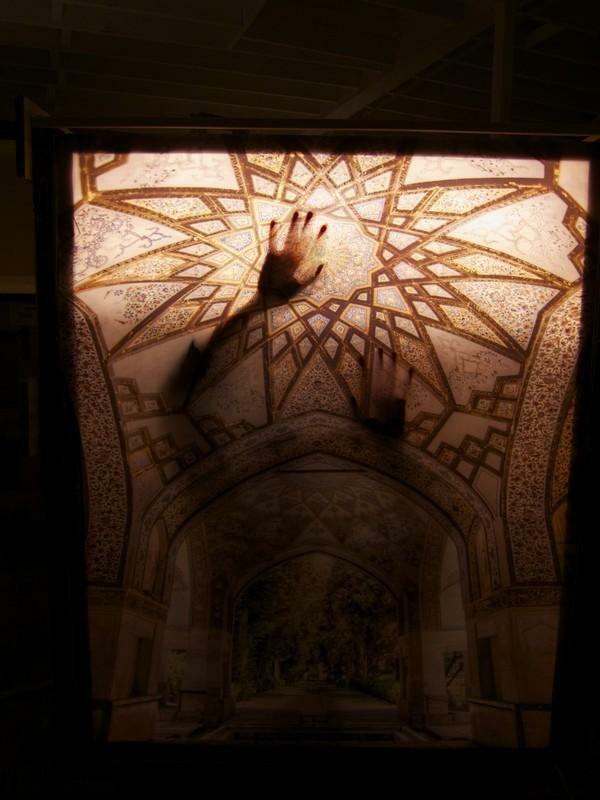 Vayghan will engage visitors from the inside a crate drawing them more fully into the experience. The Affaire In The Gardens will offer an evening tour of The Legacy Crate Series. Taking place Saturday, May 21 at 8:00pm and led by the artist, this tour will reveal a fresh side of the exhibit that cannot be replicated or experienced during the day. Crates are illuminated at night and brought to life as Vayghan will continue her performances throughout the evening. Tour will be limited to 20 people. To sign up for the evening tour, please visit www.beverlyhills.org/artshowtours. The Beverly Hills Art Show – Affaire In The Gardens features 250 artists from around the United States that will showcase an upscale, yet affordable, array of paintings, sculptures, photographs, and prints. Vetted to ensure quality, a team of professionals, including curators, art academics, and critics combed through more than 500 artist applications to select a roster of emerging and established artists that are both respected and exceptional. This free public art event features entertaining and educational family-friendly programming. 2011 Show Programming includes art tours, a dance performance by the Debbie Allen Dance Academy, artist demonstrations, and the artists’ award ceremony. The Affaire In The Gardens will feature a wine garden, food stations including: Korean, Thai and American fare, food trucks, and live ambient music. The Affaire In The Gardens’ charitable partner is the Children’s Hospital of Los Angeles. Artworks by children will be for sale in the Children’s Hospital booth. All proceeds of their sales will benefit the hospital. The Beverly Hills Art Show – Affaire In The Gardens will take place Saturday, May 21 to Sunday, May 22, 2011. General Show hours are 10:00am – 6:00pm and admission is free. The Art Show is located at Beverly Garden located along Santa Monica Blvd, from Rodeo Drive to Rexford Drive. Parking is available and inexpensive in many City parking structures – http://bit.ly/bhartshowpkg – located just south of Santa Monica Boulevard. For more information, please visit www.beverlyhills.org/artshow. Marjan Vayghan will have a concurrent exhibit at Gallery 825 from May 7 through June 3.